Canon EOS 60D is an APS-C sensor DSLR camera announced in 2010. 60D is one of the most popular DSLR in the world. 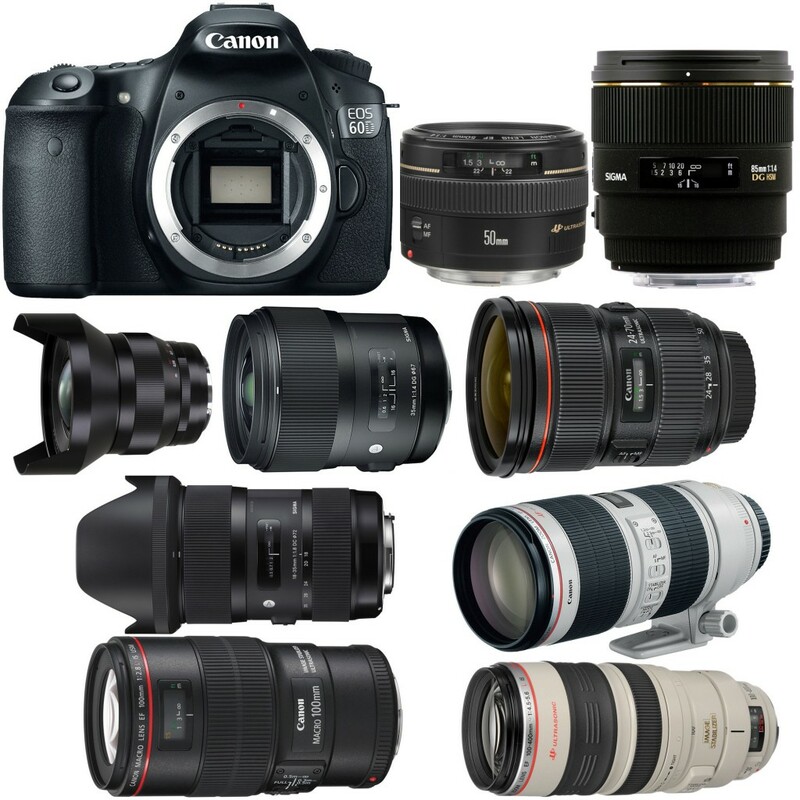 It was replaced by 70D(See Canon 70D Recommended Lenses) in July 2013. Here are several recommended lenses for Canon EOS 60D. A 50mm standard prime lens is very useful for EOS 60D. From the list below, the best choice for Canon EOS 60D are EF 50mm f/1.4 USM and Sigma 50mm f/1.4, both at an affordable price. If you looking for more expensive lenses with great image quality, you may try EF 50mm f/1.2L lens and Zeiss 50mm f/2 macro lens. The new announced Simga 50mm f/1.4 DG HSM Art lens is one of the best lens for 60D. 85mm to 135mm prime lenses are usually called portrait lenses, the Sigma 85mm f/1.4 EX DG HSM lens is your best choice for Canon EOS 60D. And for a cheaper price, the EF 100mm f/2 and EF 85mm f/1.8 are both great lenses at a price about $400. If you need an Canon L lens, the best chocie is EF 85mm f/1.2L. If you are looking for a standard zoom lens for Canon 60D, it is clear that the EF 24-70mm f/2.8L II USM is the best choice for image quality, but the price is very expensive. And if for a cheaper price lens, the new released Tamron SP 24-70mm is another great choice for Canon EOS 60D. EF 24-105mm f/4L is always a kit lens for Canon DSLRs, price as low as $700. For other Standard zoom lenses, the kit lens EF-S 18-135mm F3.5-5.6 IS STM is a great lens for Canon EOS 60D. In this range, the best 70-200mm lens for Canon EOS 60D is EF 70-200mm f/2.8 IS II USM lens, another best choice is new released Tamron 70-200mm f/2.8 lens, which is $800 cheaper than EF 70-200mm f/2.8. The 70-300mm lenses are often seen as “kit lenses”. Due to a very cheap price, these lenses are very popular on 60D. The best 70-300mm lens for good image quality is EF 70-300mm f/4-5.6L IS USM lens. The EF 75-300mm f/4-5.6 III USM lens is another great choice compared to the price. If you are looking for some super telephoto zoom lenses for 60D, below are several best lenses for 60D. The EF 100-400mm f/4.5-5.6L IS USM lens is a good lens for wild life photography. If you are looking for some super telephoto prime lenses, below are best lenses for you to choose. The EF 300mm f/2.8L and 400mm f/2.8L lenses are the best, but very expensive. If you looking for cheap one, the EF 200mm f/2.8L is one of best choice for 60D. The best Ultra Wide lens is from Zeiss. The Zeiss 15mm and 21mm Digstagon T* lenses are both great lenses for 60D. If you are looking for a cheap choice, the Samyang 14mm is the best choice. Within the wide-angle prime lenses, the Sigma 35mm F1.4 DG HSM A lens and EF 35mm f/2 IS lens are the best. The third lens is the Carl Zeiss 35mm f/1.4 but as with the previous Carl Zeiss lens, this is a manual model with no AF. The EF35mm f/1.4L USM is another good wide-angle prime lens except the price. Of course, the new released Sigma 18-35mm f/1.8 DC HSM lens is the best wide-angle zoom lens for Canon 60D. This lens is even better than most prime lenses for Canon APS-C sensor cameras. Other recommended wide-angle zoom lenses are from Sigma and Tokina. It is clear the best macro lens for Canon EOS 60D is EF 100mm f/2.8L Macro IS USM lens at the price for $1,049. If you need cheap one, the EF-S 60mm f/2.8 Macro is another great lens. Canon EOS R, RF Lenses Announced ! Canon EOS 60D Discontinued, and EOS 70D coming ?